Hiking is an activity based on walking in the area, both along paths (roads, paths), also variously equipped, both freely, outside of fixed routes. Often, the term deriving from the English language, also is referred to as trekking. The term comes from the English verb to trek, which means walking slowly or even make a long journey. Before leaving, it is appropriate to try to learn well the territory on which we will move, in particular the marked trails, the position of any points of reference, the altitude and the general orientation to the cardinal points. Clothing is of course linked to the season, but you must take into account any worsening of weather conditions. You should always include a waterproof clothing to wear in case of emergency. Preferably, use boots suitable for the type of soil that will address and specific socks for hiking (typically free of seams and with differentiated structure for a greater ease). For the latter (in contrast to what one might commonly imagine) the wool is more suitable in the summer. Boots and socks are recommended to aim for the best possible quality (they are essential). 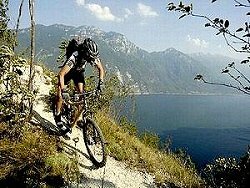 The mountain bikers and walkers in Campione del Garda have really wide choice of cycle paths and not. The paths do not require special training or special equipment as they are easily passable. Some paths are at the level of hiking and maybe you need a little preparation but nothing scary. Definitely should arm themselves with camera because you will encounter breathtaking vistas. Excursions from Campione del Garda From Piazza Francesco Arriola takes to Via Pascoli and, behind the football field, you take the abandoned stretch of the Gardesana. Passing the two tunnels, keep left along the road that passes below the waterfall of awls stream, gently ascends to the Province road nr. 38 (min. 20). Proceeding uphill for about another 200 meters, you reach the entrance of a tunnel to pass on the right following the old route until you cross the trail 201 (min. 10) connecting the port at the bottom visible, to Tremosine houses peep at the top. 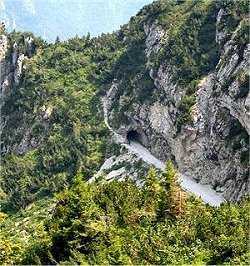 The road is unpaved and over the vertical socket running on a rocky outcrop, where you pass a small cave with a Madonna to the top of m.413 in a total time of 40 minutes. - Take, next to the oratory parish via Vagne with trail sign. 202 to drop to when it occurs in front of the roadway, blocking it, the gate of a house, drive along the fence you enter a chestnut grove and ends in via Lo. From Via Lo, common point of arrival to the two tracks, on a comfortable mule track you go up to a barn surrounded by olive trees isolated (1 hour); a trail, very scenic, in some places literally carved into the rock, runs to the ravine of San Michele, which is exceeded on bridge in iron; keeping to the left, following the sign 267 between networks, cross the cramped tunnel (as a precaution, better have a flashlight!) and you will reach the square of Campione. Excursions from Campione del Garda From Champion on the right bank of the eponymous river, part of the trail sign 267 of the "lower Garda road" with a series of steps leading to a tunnel (length min. 15 and it is recommended to bring a stack!) and a walk between a canal and a deep ravine. Leaving to the right the iron bridge, continue on trail 266 for Prabione near the cliff. Gradually, the view opens over the valley, on Pregasio, Cadignano, Sermerio, mountains Tignalga and Lavino, then the trail gives way to a trail that leads through a grove of hornbeam and comes out in the locality of Bait, near a house rustic surrounded by a lawn with chestnut (min. 35). In 300 meters you are in view of the tourist village of Campogrande; to the right, along the paved road, we go to the Visitor Center of the Alto Garda Bresciano Park, the first houses of the old town of Prabione (m. 540). where it continues to the right, along trail 204. Downhill take on the left the next two crossroads and always right up to the other Puntsèl (min. 30), from where it goes to Cadignano (min. 30). You get on the road in the direction of Pregasio (m. 478), cross it and, just before the San Marco church, take Via Lo, which coincides with the 267 of the Bassa Via del Garda. Left left the hotel Villa Selene, descend along the trail up to an isolated barn surrounded by olive trees (min. 30); the trail, literally carved into the rock, back door into the ravine of San Michele, which exceeds the iron bridge avoided during the climb; keeping to the left, following the 267 between networks, it re-crosses the narrow tunnel and reach the square of Campione. 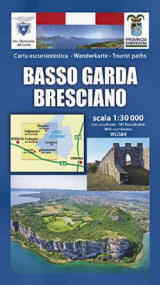 The route of the Bassa Via del Garda, dedicated to Roberto Montagnoli, a great admirer and promoter of these areas, is designed to get to know and appreciate the extraordinary alternation of landscapes and environmental situations that allow you to walk among agaves, palms and olive trees, or among beeches secular, gentians and crocuses, just a few hours' walk from each other, starts from Salo and get to Limone del Garda. It will be possible to be enveloped by the scent of jasmine in the summer or that of cyclamen in autumn; cross embattled hills with cypress trees or climb among rocks, ravines and cliffs thrilling in every season. Along ancient mule tracks with cobblestones dug during the centuries by carts and sleighs pulled by animals, stopping close to the severe walls of the lemon groves, visiting quaint villages and solitary retreats, will be the magic of stepping back in time. The path of the lower Garda road that winds on roads and paths at altitudes between 100 and 900 meters, is to be covered in several days through the various municipalities that divide Salo from Limone. In the town of Campione del Garda the path 267 is part of this route. From the square of Campione (78 m) you cross the bridge over the river San Michele and follow trail 267 leaves left the complex del'ex Olcese cotton mill, to go up the stairs trail that leads to the ravine of San Michele, spectacular. Traveled a short lit tunnel you reach an iron bridge at the junction with the paths 266 and 267 (15 min.). Take the left path 266, leaving the gorge at an altitude of approximately 350 (20 min.). Along the forest trail we get up to the paved road that connects Tignale to Prabione: bench at about 480 m (20 min.). Following right the way you enter Prabione 535 m (5 min.) And half inhabited, turn right on the trail 29 (becomes 204), for a road that leads in a northwesterly direction to the bridge (Puntsèl). 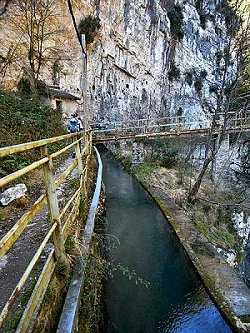 After a slight descent in Val di San Michele you enter the forest, leave on the right a building and you come to the stone bridge, thrown over the deep gorge where the rocks of the two sides are closer at an altitude around 290 (40 min. ). After the bridge the path goes up the forest and leads the way to via Bonicunter about 380 m (20 min.). Keep to the right, go up the steep road (about 500 m) until you cross the trail 203 (30 min.). The paved road Polzone - Pregasio, right towards the east, you reach the village of Pregasio 477 m, where you go up to Selene restaurant lookout over Lake Garda and the junction 267 (10 min.). Take route 267, a small road on the right just before the restaurant, to go down on a lawn terraces and then again on the rocky path into the gorge of St. Michael to return to the iron bridge at the junction with the trail 266 (40 min.). So you go back to sample in 10 minutes.